I had it all planned out when I was pregnant with Witchlette. I would sing her Tura Lura Lural because I decided that was my favorite lullaby and I wanted it to be Irish. One day while prepping her nursery, I was listening to Pandora and I heard 1000 years. I sat down and cried with over whelming emotions of just how much that song rang true for me. I died everyday waiting to have her. I loved her before she was here and I will love her for all time. Fate brought her to me and made me her mom and I’ll love her forever. That became her lullaby. I sang it to her almost every day. Then she started talking and we didn’t need a song anymore. We were having conversations with a back and forth and I didn’t need the musical filler to take up the silence in the room. It is still a song I sing to her when she doesn’t feel well or is just generally in need of a snuggle. But the singing times were becoming fewer and farther between, especially since her brother’s birth. My pregnancy with Witchling was much more of a whirlwind. I never stopped to plan a lullaby for him. Which works because I have yet to sing my planned lullaby to Witchlette. But I hadn’t sung to him at all until a few days ago. A few weeks ago, I was changing his diaper when I had a strange sense of deja vu: I remembered changing a baby who wasn’t Witchlette on a blue changing pad wearing a light green creeper. I remember in my dream feeling this incredibly strong pull towards this baby but I knew it wasn’t Witchlette. I had dreamt of Witchling and everything was meant to happen and good in so many ways. It hadn’t fallen as perfectly into place as Witchlette did, but it still fell into place. A few days after my dream, I had the song from Sleeping Beauty, Once Upon A Dream, stuck in my head and I knew that was his lullaby. I know him, I dreamt of him before he was conceived. Things may not be as easy as they seem or as easy as they could be, but I love my boy and he loves his mama, just like in my dream. This afternoon I found both songs on Prime radio and played them and sang them to the kids. Witchlette really liked hearing hers again and wants to hear it more often. I admittedly haven’t sang to her much since my second trimester with Witchling. And Witchling is captivated by his lullaby. Because music is the language of the soul. I came across this lovely gem recently. I will be sharing some more in the coming week. 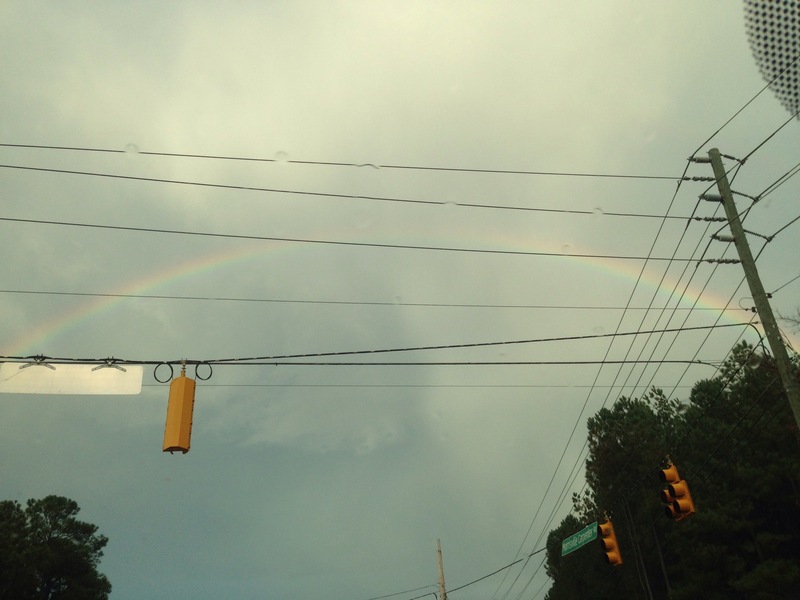 Last week there was a beautiful, big, full arch rainbow in my town. I saw it at Witchlette’s school and was able to snap a picture of it at a red light after picking her up. I pulled over just after pulling into my neighborhood and snagged another shot. 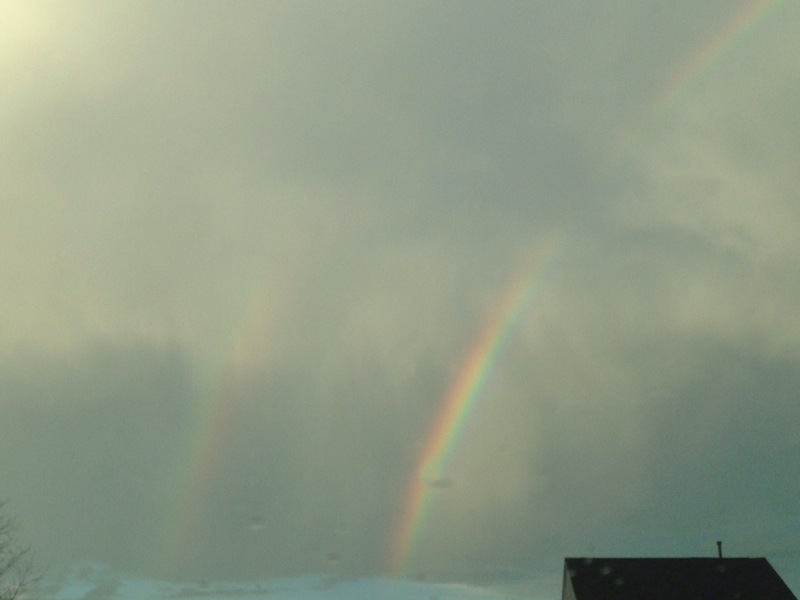 I was really excited that, when looking at the rainbow from my neighborhood angle, it was a double! Last night we watched The Muppet Movie, the original first one. Witchlette loves Beaker and Animal. She was asking for more “Me-mes” aka Beaker on the YouTube channel and I didn’t think I could sit through more Ode to Joy a la Beaker at the moment. So we compromised. Ok, so I needed something positive to move off of the Fox News updates that have taken over. Angels & Airwaves is a side project from one of my favorite bands, Blink 182. Tom DeLonge, guitarist and vocalist for Blink, formed the band. Multiple interviews with Tom and Mark indicate Tom needed a change due to his new-found religion and Angels & Airwaves was his way of doing so. Many of the songs have a spiritual undertone, though I haven’t heard one yet that indicates blatant religious affiliation. One of my favorite songs from this band is “Everything’s Magic”; it sounds a lot like how I live. Appreciate each moment. Every flower, every cloud, every moonbeam, every raindrop. Every experience, from the grand to the mundane, is all Magick. And do you ever tell yourself don’t try? Kings of Leon are a rock group based out of Tennessee. They are a family of musicians, with three brothers and a cousin. Dad’s name is Leon, as is Granddad’s so they are the Kings (sons) of Leon. Leon (the dad) is a preacher and the guys are very open about their faith. Some of their songs are blatantly Christian. These are the songs which I personally skip over. Other songs are just fun, or are spiritual with the intention of being Christian but are not overtly so. One song, Manhattan, is actually about Native Americans. One of my favorite look around and enjoy sings, “Big Yellow Taxi”. The point of the song is to take in the little things and enjoy every moment. Because you can blink and the thing you loved the most can be taken away. So I’ve already discussed how most, if not all, of the “Christmas traditions” are stolen from Pagan celebrations. Strike the harp and join the chorus. Because caroling is a Pagan tradition. While I tell of Yuletide treasure, Yuletide treasure! Another admittance! So, in summary, Dec the Halls is a TRUE Yule song. Not a “Christmas Carol”. And don’t let anyone tell you otherwise. This one belongs to us! Let’s embrace it! !